Mon, Jul 9, 2018, 08:43 pm SL Time, ColomboPage News Desk, Sri Lanka. 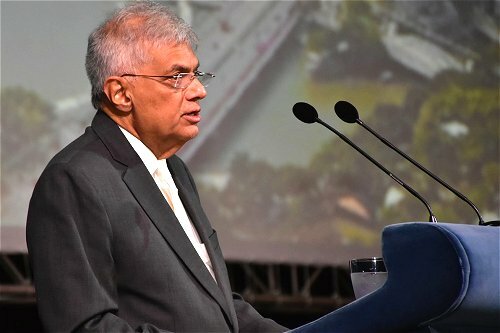 July 09, Singapore: Sri Lanka's Prime Minister Ranil Wickremesinghe says that the task of building livable and sustainable cities require integrating with global supply chains, social inclusivity, and access to new and old ecosystem services. Delivering the key note address at the opening session of the World Cities Summit, International Water Week and Cleanenviro Summit in Singapore Monday under the title 'Livable and Sustainable Cities of The Future: Transcending Challenges of the Anthropocene", the Premier said urbanization has been a transformative trend that has propelled economic growth. He noted that Asian urban centers are taking the lead in integrating their national economies with global value and supply chains. Metropolitan regions with mega infrastructure is the key to transnational connectivity that enables global economic integration. "By bringing people and enterprises together, large cities have become centers of industrialization and modernization. They have reaped the benefits of economies of agglomeration," he noted. Speaking about the progress Sri Lanka has made and the government's plans to develop the island's major cities and transport corridors as it continues to drive the economic growth, the Premier said Sri Lanka's long-term objective envisages exploiting its strategic location in the Indian Ocean to ensure the economic development in a region which will be pivotal for global economic growth. By 2050 the population in the littoral states of Bay of Bengal - that is in the East Indian Ocean alone will be 2.9 Billion, he pointed out. The Prime Minister highlighted that the key thrust of the Sri Lanka initiative will be the Western Megapolis and the two connecting corridor which will cover 9 million people. The mega infrastructure includes the development of the ports of Colombo and Hambantota in the South. The new landfill adjacent to the Colombo Port is planned as an offshore Financial Centre. Four Special Economic Zones will provide the infrastructure for industry. For Sri Lanka to deal with the challenges of urbanization, Sri Lanka needs to politically and financially revitalize and empower local governments as the biggest issue in the management of mega-cities is that they involve many levels of Government and Local Authorities, the Premier said. Speaking of the water management, the Sri Lankan Prime Minister said Singapore is truly leading the field and "we can all learn a great deal from Singapore in their wise management of this critical input for livability and development." The Premier also noted that in recent times, human communication has been completely overshadowed by developments in technology such as high speed internet and electronic communication and it can have an immense impact on the way we live in and govern cities. "Driven by sophistication in electronic sensors for information capture, new generation high-speed internet for rapid information transmission or receipt, and artificial intelligence for making judgments based on the analysis of massive volumes of data, "things" are now communicating, both with each other and with humans," he said. The Sri Lankan Prime Minister concluded his speech asking "How can this phenomenon of hyper-connectivity based on artificial intelligence and the "Internet of Things" be mobilized to maximize human safety and well-being to develop smart, secure livable and sustainable cities?" The 6th World Cities Summit along with the 8th Singapore International Water Week and the 4th CleanEnviro Summit Singapore, from 8 - 12 July 2018 opened in Singapore with the participation of representatives of around 135 countries.